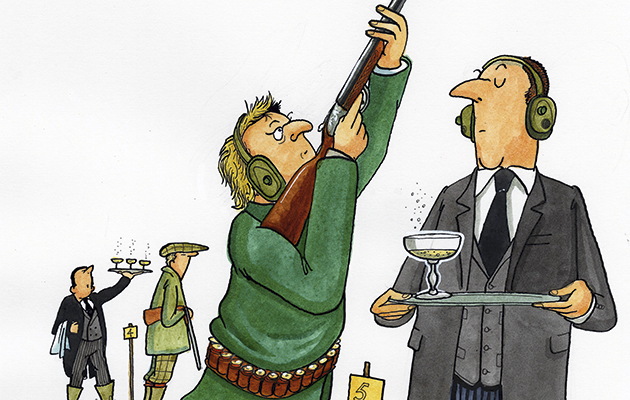 Shooting etiquette: are standards slipping? 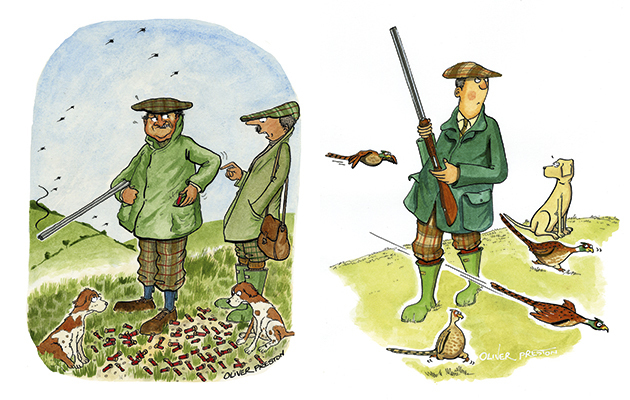 The behaviour of guns, hosts, pickers-up and keepers nettles Robert Gibbons. Should he simply get used to it, or is shooting etiquette worth honouring? Shooting etiquette has slipped for Robert Gibbons. Butlers serving champagne, pins badly placed, dogs despatched during drives and too many guns have all rankled him in the past. But are these simply the new shooting etiquette standards, and something that he must get used to? For etiquette on a horse rather than the hill, read hunting etiquette and manners in the field, or check that you are keeping your guests happy with the best shoot lunch. Is yours up to scratch? SHOOTING ETIQUETTE: JUST AN AGE THING? It may be the age thing but during this past season I became increasingly aware of just how poor the shooting etiquette is on some shoots. Like a lot of things these days, it’s called change. A friend admonished me for my observations after we had both participated in a shoot with particularly bad shooting etiquette. It was not, he told me, a question of a drop in shooting etiquette standards; it was a change in standards and I had better get used to it. He may be right but some things do rankle and you do not have to be a senior shot to feel “rankled”. I have come to terms with some poor shooting etiquette, such as people turning up without a tie, wearing a funny hat, dressed as a tramp with dirty boots and shoes from their last outing. Last year, though, was near the knuckle when one of the guns arrived at the shoot sporting Taliban headgear. He was a poor shot and rolled his own cigarettes, a habit I thought he might have picked up in Afghanistan while in the military, had he not told me that he bought the hat in a Finchley car boot sale and had never experienced a gun fired in anger. Having become used to the occasional Russian army hat, I suppose I will succumb, but looking back on the year there is some poor shooting etiquette I feel I could have done without. 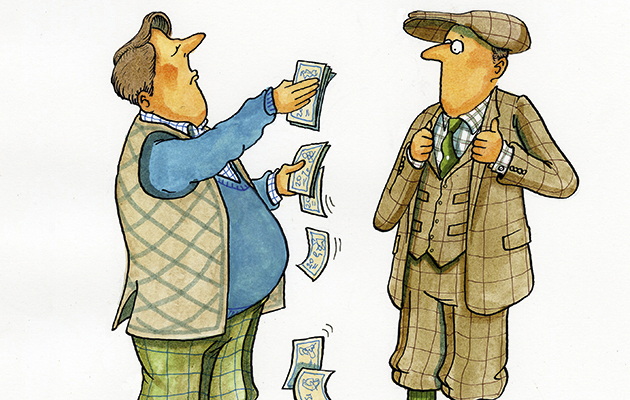 “I was particuarly annoyed on a grouse day at being told what tip I should give the keeper”. Among them was the day when there were just too many guns. Even on the grandest shoots, it is difficult to get birds to fly over all the guns at every drive. To find on an early pheasant-shoot, when the birds did not fly particularly well, I was one of 10 guns meant that for a least two drives I didn’t fire a shot. On one shoot the pins were placed in locations that made shooting impossible, which is terrible shooting etiquette. I was not happy walking in light drizzle to a pin in the middle of knee-length kale, only to be soaked to the skin. Then there was the pin placed on a slope, making a proper stance difficult to maintain, and the one put in a dense wood surrounded by high conifers, making visibility of any oncoming bird nigh impossible. Had I wanted snap-shooting, I could have gone ferreting. Then there was the pin that I was required to climb over a barbed wire fence followed by a stone wall, then cross a stream in flood and a stile to reach. A day’s shooting is not meant to be an assault course. The whole experience was not just fatiguing but a hazard. Why do they do it? It is poor shooting etiquette. On several shoots the dogs of pickers-up and some of the guns were despatched during the drive. I find this practice of shooting etiquette frustrating and aggravating. If you have your own dog, the animal is denied the opportunity of showing off its prowess. If you don’t have a dog, it is annoying to have your birds picked when you are trying to shoot; you are left not knowing what has or has not been recovered to your gun at the end of the drive. Then there was the January day in Ayrshire when the weather was so appalling as to render pleasure absurd. Arctic winds, low cloud and driving hail made shooting impossible as visibility was intermittent. The pheasants were scattered and flew away from the guns. It was bitterly cold. At the break I tentatively asked the keeper whether calling it a day had been considered. His reply remains an indelible memory: “Not at all. You’re not here to enjoy yourself.” There is no point in continuing to shoot when conditions are appalling and it is good shooting etiquette and no shame for a host in calling a halt. On one shoot, which was otherwise well organised, the day was spoilt for me when at each pin I was surrounded by spent cartridges from previous days. This is the equivalent of eating off a dirty plate and I cannot think why the keepers allowed it to happen, it is poor shooting etiquette. I could mention shoot lunches but I have already covered the subject in these columns (October 2010 issue). However, I felt a shoot in Gloucestershire need not have served champagne in silver goblets at the break, poured by a butler in white gloves. I came to shoot not to attend a wedding reception. I was particularly annoyed on a grouse day being, albeit politely, told at the end of the day’s shooting what tip I should give the keeper, a shooting etiquette practice that seems to have become commonplace, particularly on grouse days. Some requests have been outrageous. A friend who was invited to shoot in Yorkshire, where 10 guns shot 350 brace, was told that a £200 tip would be in order. If you multiply that by the number of guns, the keeper would be receiving £2,000. Some tip. If the host wants a contribution to his keeper’s wages, he should make this clear in the invitation to shoot. On the same shoot, my host announced that if anyone shot a blackcock or greyhen, there would be a £200 fine to go to the Game Conservancy. Not on my watch. Spent cartridges and low flying birds have rankled Robert Gibbons in the past. A couple of shoots I was on insisted on taking the guns round in a converted truck, rather than let them take their own vehicles. I found it most inconvenient and poor shooting etiquette. People like to keep their own vehicle and kit with them and not be squeezed into a bus with half a dozen damp dogs and nowhere to put their guns. The farther north you shoot, the days get shorter. In late December and January it can be dark by 2pm. To make sure we shoot in daylight we shoot straight through, finishing at 1.30pm to lunch around 2pm. It bewilders me that it is acceptable shooting etiquette to break for lunch then have guns go out in near darkness for a final drive when the birds are on their way to roost and everyone wants to go home. Then there was the day’s shooting last November in the Borders, where I had not shot before. It was one of the most unpleasant days’ shooting I have ever experienced. I drew five. We were eight guns and I was told I was a walking gun, which did not amuse me on what I had thought to be an upmarket shoot. We drove to a hillside and I was directed to walk up slowly 20yd out from a long belt of fir trees as a line of beaters came in from our right taking birds as they flew out till I reached my pin. Walking up the hill not one pheasant flew over me. On reaching the pin I stood for about 20 minutes in driving rain waiting for the flush of pheasants. None came. Then I heard the horn indicating the drive was over. I presumed I would be drawn seven for the next drive (moving up two). I enquired where the pin was, to be told that due to the change in the wind we were leaving out the high numbers and I would be three, a walking gun. This involved trudging across a deep-ploughed field for about 200yd to a pin at the far end of a strip of conifers. By the time I reached the pin I was exhausted and my shoes were soaked. All the birds flew to the guns on the other side of the conifer wood and only one pheasant flew out, hugging the tree line, too low to shoot. Two drives down and I had still not fired a shot. My host apologised and said that the previous week all the pheasants had come over my pin, adding that due to the bad weather we would shoot straight through. There were no elevenses offered. I enquired what my number was now. It was five, a walking gun. I was asked to climb up the precipitous and slippery side of a burn to take birds as they flew down past me. The other guns were positioned farther up the ravine, out of sight. Pheasants did come down at considerable speed but I found it impossible to raise my gun comfortably to take a shot, fearful of slipping on the moss-covered ground into the deep gully in front of me. I didn’t fire a shot. beaters in the watery distance. I had never seen a drive like it. Nearly all the birds flew to the left of me and the ones that did come were too low to shoot. The horn went, the drive was over. By this time the weather had turned for the worse and it had started to snow. No butlers, please. Guns haven’t come to a wedding reception. For the fourth drive I was a back gun. Put behind one of the best shots in Northumberland all I could do was to wave my gun in the air at birds already shot. Drawn three, the keeper told me to stay on the road and keep walking as the birds would be coming from a game crop out of my sight, where the other guns were. I did keep on walking – back up the road to my car – and drove home. When my host’s wife called the following day, concerned at my early departure, I said that I thought I had been invited to a shoot, not for a day’s hiking. No good shoot should be planned around a walking or a back gun. Finally, I do not care much for the shooting etiquette practice on some shoots of a sweepstake, guessing the bag, with the guns putting in a fiver or more into the pool. I was, however, amused by an addition to the arithmetic on a shoot in Norfolk, when we were asked to add the age of the keeper’s wife. As nearly all of us barely knew the keeper, let alone his wife, the result was a complete lottery. Obliged to participate, I added 38 to my total, which, for once, secured me the purse. I was later told that the good lady with whom the keeper lived along with their three children was not, in fact, his wife as they had never married. Needless to say, I have no intention of making a refund. Happy days!